Joko Widodo was forced to cancel a planned trip to Jambi due to poor visibility. Singapore’s banks will have to publish sustainable lending policies on their websites and annual reports from 2017. Supermarkets in Singapore began to remove products supplied by Asia Pulp & Paper. Indonesian President Joko Widodo’s flight to visit firefighting efforts in Sumatra was diverted on Thursday after the region’s haze kept flying visibility below the legal minimum. Jokowi and Health Minister Nila Moelok cancelled their visit to the haze-hit region on Thursday. Indonesian news magazine Tempo said it was the second time in a week Jokowi canceled the visit to the region. Air quality in Malaysia and Singapore improved on Thursday after rain on Wednesday dispersed pollutants. Air on Thursday afternoon was firmly in the “moderate” range in both countries with southerly winds too weak to carry pollution over the Malacca Strait. Singaporean Prime Minister Lee Hsien Loong tweeted a picture of blue skies. “Very unhealthy” air quality in Jambi and “unhealthy” air in Pekanbaru on Thursday continued to pose fatal health risks in Sumatra. Children have begun to return to school in South Sumatra and Jambi after light rainfall reduced the number of hotspots, according to Indonesia’s disaster mitigation agency. The president is having to juggle firsthand monitoring of efforts to contain the haze with appointments related to promoting a major economic stimulus package, which was announced on Wednesday. Jokowi now plans to travel more than 300 kilometers overland on slow roads from West Sumatra to haze-hit Jambi on Saturday, Indonesian media reported. “It was agreed that we will cooperate with a number of our partners in our efforts to suppress the forest fires,” Foreign Ministry spokesman Arrmanatha Nasir said. The Bangkok Post reported that Thai Foreign Minister Don Pramudwinai called the Indonesian ambassador for a meeting to discuss measures being taken. Haze blanketed the tourist island of Phuket on Thursday, generating a flurry of international media coverage, while an Indonesian broadsheet went to press with one of the great newspaper front pages. 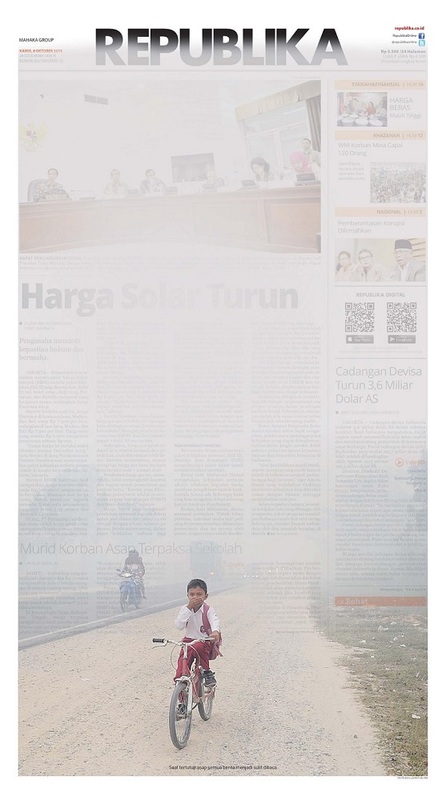 Republika hazed out its front page on Thursday. Private-sector initiatives to address underlying causes of agricultural fires are beginning to emerge. Supermarket chains Prime, NTUC FairPrice and Sheng Siong have started to remove products supplied by Asia Pulp & Paper, a major plantation firm under investigation for fires on its concessions. Singapore’s banking association released guidelines on Thursday that will incorporate environmental factors in lending and investment decisions. The 158 banks in the association, which includes the city-state’s three largest lenders, will have to publish environmental policy framework in 12-18 months.